From the Pitta bread of the Middle East, Naan bread of India to the Rye breads of Scandinavia; Bread is found in all sorts of forms or shapes in most cultures. It is the staple diet of many. Even the word Bread has come to take on more significance than its nutritional values. It is used in religious rituals. " Breaking bread " to describe the gathering of souls, friends and family," Putting bread on the table " basic necessities, " Bread winner " living conditions and even value either in monetary or worth " Best thing since slice bread " or " lots of dough ". But all in all, few types of cooking will offer you more rewards than Bread making. The actual hands-on process of mixing, kneading, folding, proofing, shaping and baking is immensely satisfying and you would be surprised how much fun it can be too. The basic skills are really easy to learn and it requires no special equipments to produce great breads," just your hands "along with a little practice and guidance. 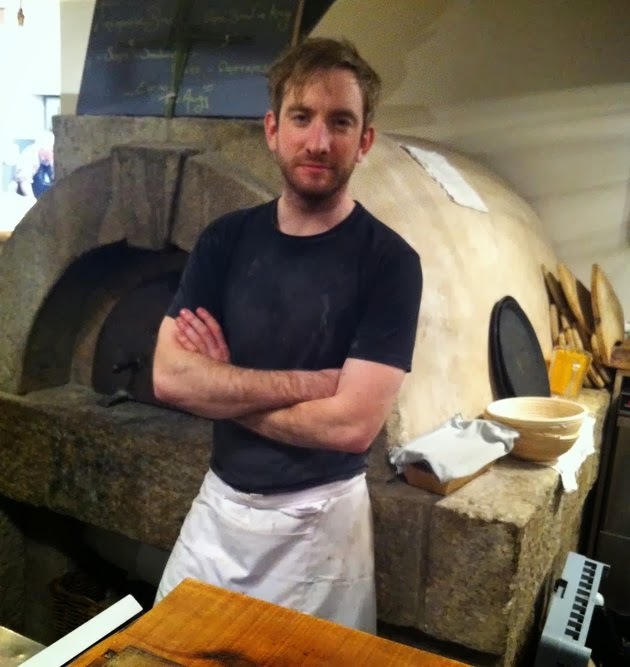 This week, I went along to the Bread making class of Patrick Ryan from The Firehouse Bakery in Delgany, County Wicklow, just outside Dublin.
" King of the Table ".For him, Artisan bread making is a labour of love, in the old style with no preservatives and his passion was contagious. We were warmly welcomed on arrival by Patrick himself. The group was kept small, with only 8 of us in total, it felt like a one to one lesson. We rolled up our sleeves and worked side by side with Patrick while he introduced us to the world of real bread and it's versatility. 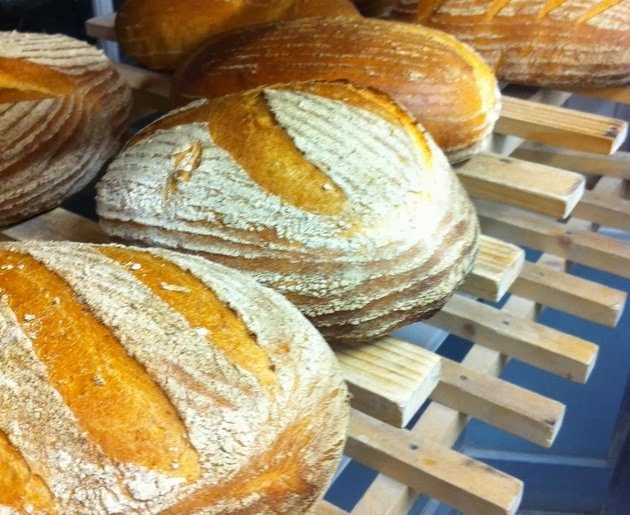 From the beautiful Rye bread, the Malt house to the Great white Sourdough. From fresh yeast, dry yeast to bread soda. 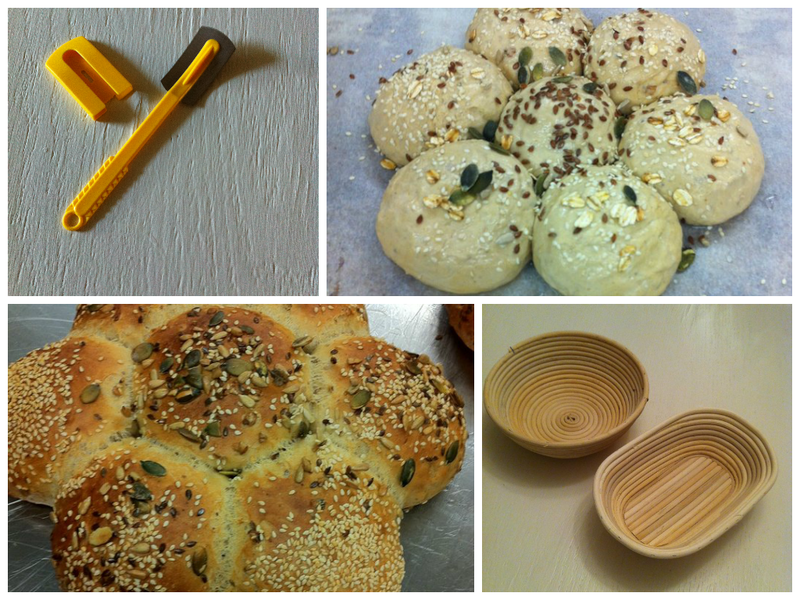 It was very informative and broke down many myths that I had about bread making. and shown how to check for the window-pane effect. This was basically holding the dough up to the light, it should stretch without breaking and still hold it's own weight. One should be able to see one fingers through the stretched part, hence called the window-pane. The dough at this stage should be soft and elastic. While the following recipe produces a great white loaf, it is also a fantastic all purpose dough. Flatten it out for Focaccia. or a 200 grms portion of dough produces a 12" pizza base. Mix the flour and salt into a bowl. Make a well in the centre. Crumble the yeast into the water and stir to dissolve. Pour the water and olive oil into the well. 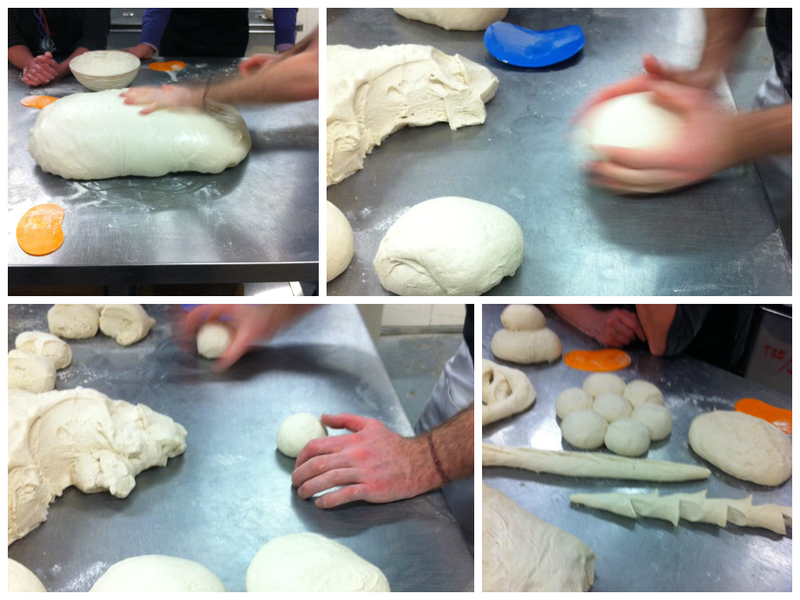 Bring the dough together with your hands or a spatula/ scraper. Do not be tempted to add extra flour if you think the dough is a little sticky. Turn out onto a clean surface and knead for at least 10 mins in short strokes until you obtain a soft and elastic dough. Check for the window-pane effect. Spray your hands with a little of oil and fold back the dough onto itself into a soft and glossy ball shape. Place into an oiled bowl, cover with cling film or damp tea towel and allow to prove for 60 - 90 mins, until doubled in size. 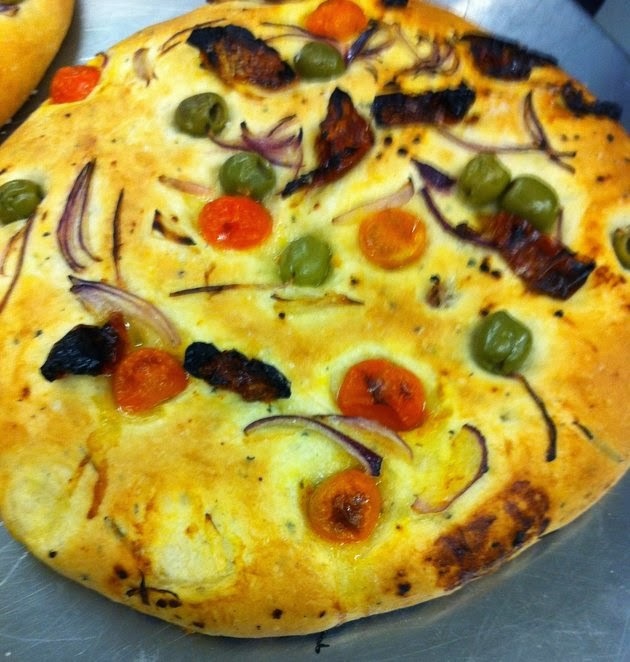 Turn the proved dough onto your work surface once again and knock it back. Knead for another minute or so . Fold over, shape and place seam side up into a floured loaf tin or proving basket, cover with cling film or damp cloth and allow to prove once more for about 50 - 60 mins. Pre-heat you oven to 220c/gas mark 7. Place a baking tray in your oven and another at the bottom of your oven. When ready to bake, turn the loaves onto one of the heated tray, slash a few cuts with a razor across the top (A baker's signature). This is more than just esthetics's, it will allow the steam to escape and you will get that great crust. Pour some boiling water from a kettle into the bottom tray to release a blast of steam. Place your loaf in the oven and bake for 35-40 mins. Resist the temptation to get stuck in until the loaf has cooled down. "Now, thank God for the hands that made it ". Use the same recipe as above increasing the oil content to 100 ml & some chopped thyme and rosemary. It should be a bit wetter. Flatten out to about 2 cm in thickness using your finger tips with the characteristic dimples you would expect. Cover generously with olive oil , smoothing it over the surface and pushing in more dimples if needed. Add your chosen toppings liberally ( olives, sun dried tomatoes,red onions,herbs.. etc.. ), pushing it gently into the dough. Place on to a baking tray , cover with a damp cloth and leave to prove for 45 mins. Just before baking, Sprinkle with coarse sea salt and bake at 200c for 15 - 20 mins until lightly golden. Once cooked, drizzle with olive oil and allow to cool on a wire rack. Whether you are a beginner, experienced home baker or simply a food lover, Patrick Ryan's bread making course will take the fear out of bread making for you. 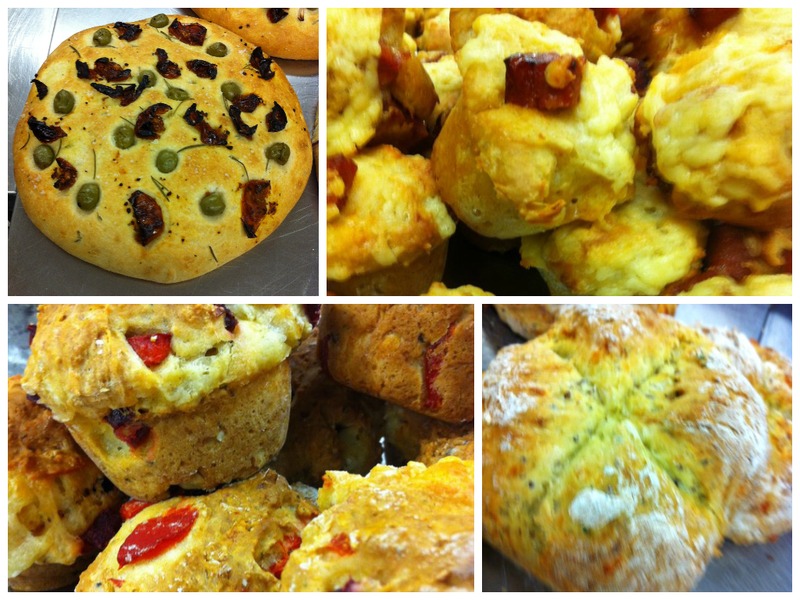 By the end of the class, you will have seen your yeasted loaves & focaccias rise, produced authentic granary party bread and made both sweet and savoury soda bread. In his own words return bread to it's rightful place as " King of the table"